Kleine Kammermusik recorded live on WRTI, April 10, 2019. Susan Lewis, host. 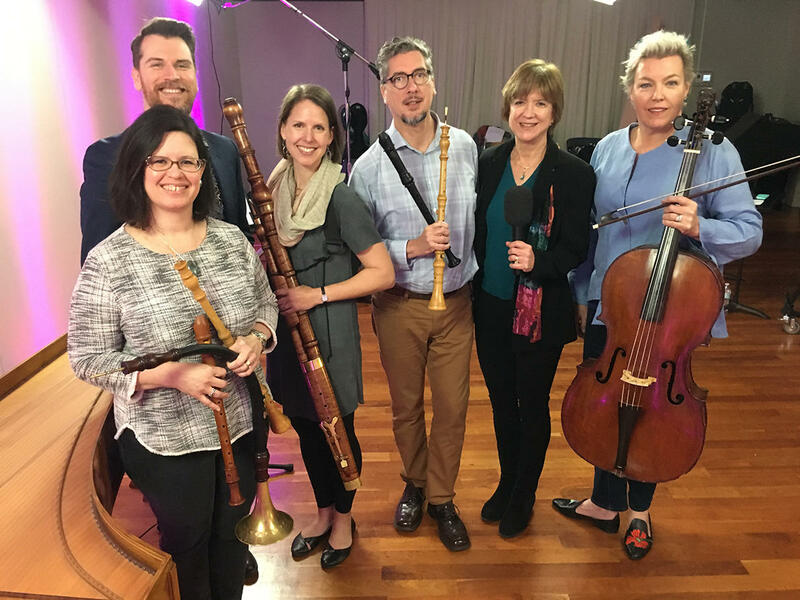 Described as "a jewel among U.S. early music riches," (online dance journal, ThINKing Dance), Kleine Kammermusik performs on oboes and recorders, bassoon, cello, viola da gamba and harpsichorrd. The group visited WRTI and performed a preview of their concert at the Hill-Physick House. WRTI's Susan Lewis is host. PhilaLandmarks Early Music Series presents Kleine Kammermusik in a program of French Baroque music entitled, Dialogue of the Graces, at the Hill-Physick House, Society Hill, Philadelphia on Thursday, April 11th at 7:30 PM. Info here. At WRTI, they'll play concert highlights as well as music by J.S. Bach. In the WRTI Performance Studio with Susan Lewis, host. Kleine Kammermusik is dedicated to bringing to life the wealth of chamber music for winds and continuo. With paired treble instruments (oboes and recorders) and a supportive continuo group of bassoon, cello, viola da gamba, and keyboard, the group comprises a versatile blend of instruments suited to music from a wide range of contexts, from vivid outdoor celebrations and military fanfares to intimate chamber works. The ensemble derives its name from that of a chamber ensemble at the Dresden court in the early 18th century, as well as from a collection of pieces by Telemann dedicated to four oboists. Intimate in nature and flexible in instrumentation, these pieces embody their approach to sharing music in a colorful, conversational, and creative way. Kleine Kammermusik has performed and given workshops in Boston, New York City, Philadelphia, Providence, Connecticut, and Washington, DC. Live broadcast with Sonnambula on March 12, 2019. WRTI's Susan Lewis, host. Praised as "remarkable" and "superb" by The New Yorker, the early-music ensemble Sonnambula—a viol consort based in NYC—visited the WRTI 90.1 Performance Studio and played highlights from upcoming concerts with Piffaro, The Renaissance Band and works from a new album of music by 17th-century composer Leonora Duarte. WRTI's Susan Lewis is host. Listen to the performance recorded live on WRTI, May 8, 2018. Hailed as “radiant” by The New York Times and “ethereal" by Newsweek Polska, the award-winning early music ensemble Peregrina, from Basel, Switzerland, will perform on WRTI in advance of upcoming concerts with Piffaro, the Renaissance Band.